This is part 3 of a look back at 15 years of Quest. Here are links to the previous posts: part 1, part 2. 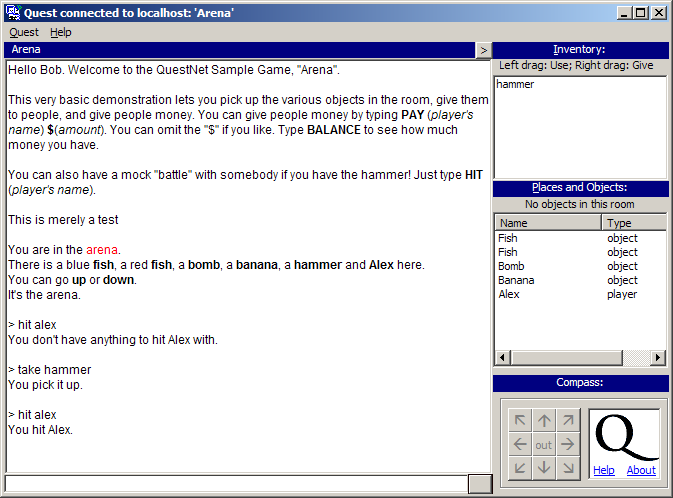 The first alpha build Quest 3.0 was released in March 2000, and fixed one of the weird design flaws of previous versions by unifying “items” and “objects”. Objects now had to have unique names, but they could have aliases, which would be displayed to the player instead of the code name. This version also introduced a disambiguation menu to allow the player to distinguishing between different objects which had same the alias. This is fundamentally the same approach to object handling that Quest still uses today. That first alpha of Quest 3.0 also added timers. The second alpha in July 2000 added support for a truly experimental feature that never quite took off – online multi-player play. This allowed Quest to connect to a new bit of software I was working on, which started out with the name “QX3” and was later renamed “QuestNet Server”. 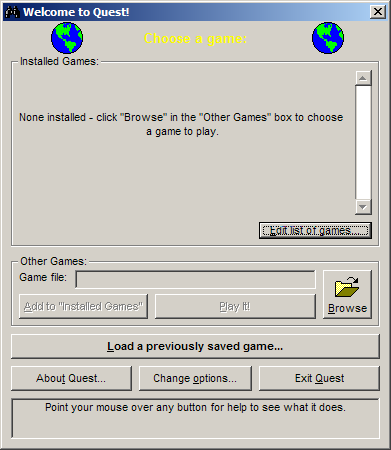 The idea was that the game ran entirely on the server, and players would connect to it using the Quest software. This would allow multiple players to connect to the same game world, where they would each have their own inventories and be able to interact with other players. Questnet is a good idea that is kind of struggling to get off the ground. There are no games because there are no players and no one wants to spend aged writing a game if there are no players. What came first, the Chicken or the Egg? The technical demands of hosting a QuestNet game are out of realistic reach of most of us too – even if I wrote a QuestNet game, I couldn’t “serve” it – I just don’t have the facilities. In the days when most of us were still using dial-up, the idea of running a server on your home internet connection just didn’t make a whole lot of sense. QuestNet Server would hang around for a while, never getting much use or ever seeing its full potential. I still think there’s something in the idea of multi-player interactive fiction, and maybe it’s something to revisit some day. Watch this space! The second alpha of Quest 3.0 also got rid of the separate concept of “characters” – they were now just objects too. It added support for arrays, and arbitrary object properties allowing any kind of data to be attached to an object (although these were separate to the built-in properties or “tags”, which meant that you couldn’t easily read or update data like an object’s “look” description – this flaw was resolved when Quest was rewritten for v5.0, when all object data was finally stored as properties). 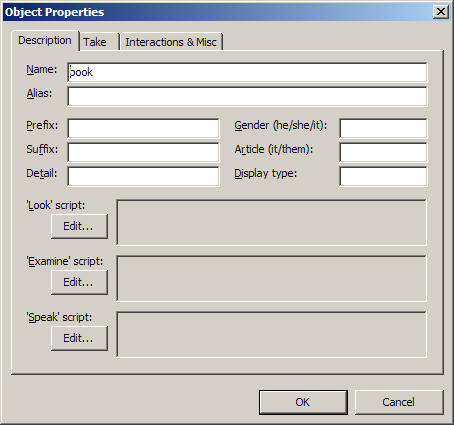 A third alpha build followed in September 2000, which added object types – allowing object properties to be inherited. 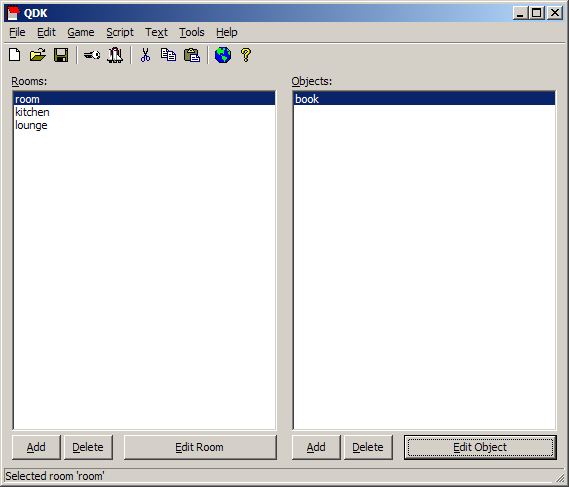 This also added support for creating rooms on-the-fly via script. In October 2000, I moved to London and started university, so progress with Quest slowed down quite a bit. 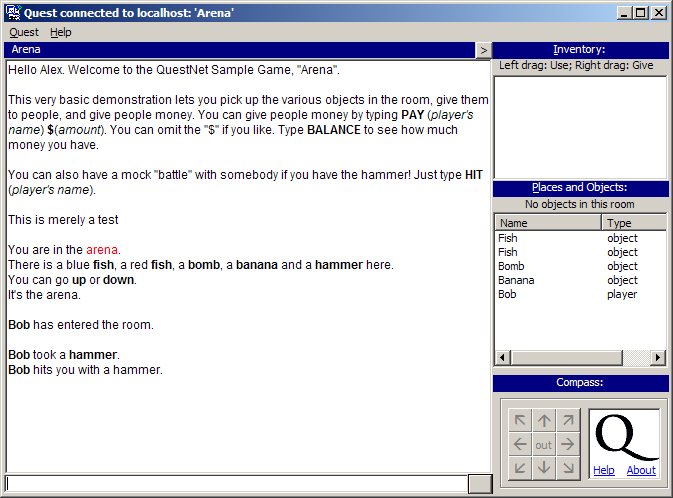 In March 2001, Quest 3.0 reached its first beta release. This added support for dynamically creating objects and exits, and added script properties (“actions”). The second beta followed in April, featuring various minor tweaks to get it closer to a releasable version. Quest 3.0 was finally released in September 2001, and QDK was updated at the same time to get a cleaner interface and to support all the new Quest features. It also gained a new script editor. A few bug-fix releases followed very shortly afterwards, and then I started working on v3.1. This added support for MOD music files – something I was into creating myself, but a feature I think was never actually used by anybody. There were various other tweaks, including improvements to the parser. Libraries gained the ability to add panes to QDK (here again is an example of a feature that was added which is now a core part of how Quest works – as of v5.0, all panes in Quest’s editor are defined by libraries). Quest 3.1 was released in June 2002. 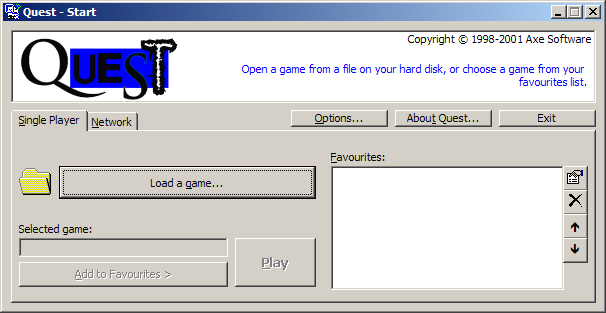 The next update was version 3.5, released in December 2003, featuring the ability to translate the player interface (although not on a per-game basis – it was a player setting), plus support for text-to-speech and opening ZIP files. Following slightly later in January 2004 was the first non-beta release of QuestNet Server – although, as it would turn out, it would never get another significant release after that, simply keeping pace with features as they were added to the single-player version Quest. The pace of change was clearly slowing down, as I was keeping busy with my Physics degree. It got even worse after I graduated in 2004, and started working – I didn’t really touch Quest for almost two years. But when I finally came back to it, I dived into it in a big way. More on that next time! For a trip down memory lane, all posts from the old forums from 2000-2003 are available: Quest Forum, QuestNet Forum, Games and Chat Forum. Posts from 2003 onwards are all part of the current forums. This entry was posted in Quest and tagged history on November 27, 2013 by textadventurescouk. This is part 2 of a look back at 15 years of Quest – part 1 is here. Immediately after releasing Quest 1.0, in November 1998, I got started working on Quest 2.0 – the first alpha version was released only a month later, in December 1998. This version incorporated the early feedback I’d received from v1.0 – making room descriptions more customisable, adding functions, numeric variables and “for” loops, improving the in-game debugging information, and fixing various bugs. It seems surprising to me now that I didn’t ever do a bug-fix release of v1.0 – I guess that so few people were actively using it, and there were so many rough edges anyway, it must have made more sense just to plough on and pour everything into v2.0. And this was before I’d ever heard of source control anyway – in fact, I doubt I’d have even had any kind of backup copy of the Quest code at the time. (It was a time when I was constantly running out of hard disk space, when floppy disks were too small, before I had a CD writer, and before any significant amount of online storage space was easily available). Over the following months I added more features – more text formatting options, allowing objects to moved and hidden, and libraries to allow Quest functions to be re-used between games. It was all a nice break from working on my A-levels and filling in my UCAS form. 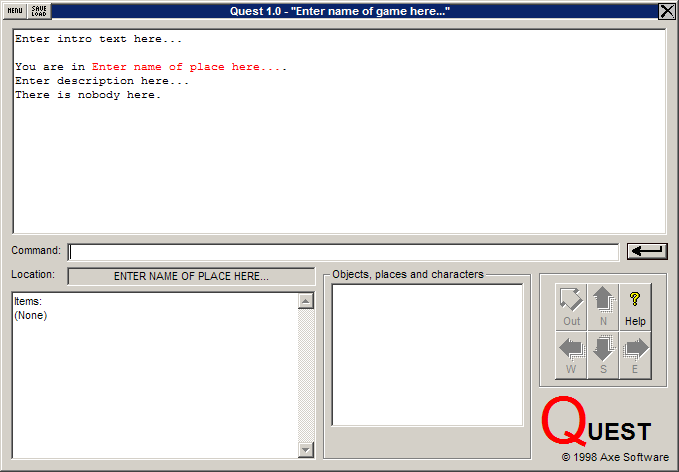 Quest 2.0 was released in August 1999, and for the first time included a beta version of a new visual Quest game editor called “QDK” – meaning finally you no longer had to code games using a text editor. (I would have called the editor “QED” but there was already a Quake editor of that name). 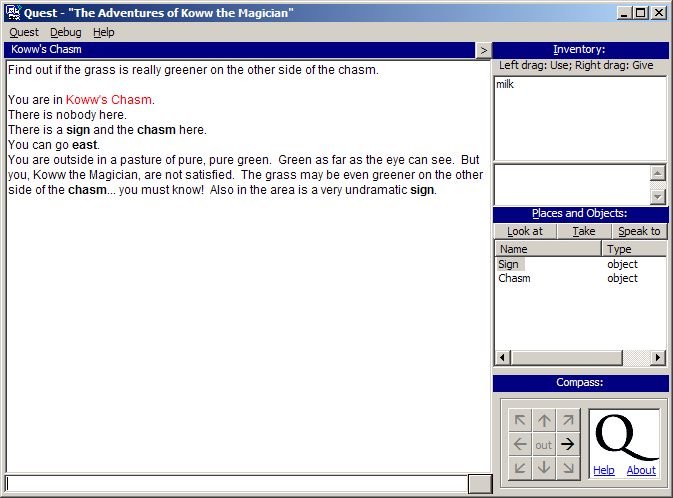 Quest 2.0 is the first version for which at least one actual game was made – and it’s still on textadventures.co.uk, and it still works today, whether you download it or use the web-based player – The Adventures of Koww the Magician. There are a total of 28 games on textadventures.co.uk which were written for Quest 2.x – see if you can find them… (the column to the right of the game listing will tell you the version of Quest used to build the game). The “libraries” feature got some early use, with Alan Bampton creating a “Standard” library to add some features, including containers – which Quest was still years away from supporting natively. This library was included with Quest itself as of v2.11. (10 years later, when redesigning Quest for v5.0, libraries became the way to add all functionality to Quest – without its Core library, Quest 5 does very little at all). By early 2000 my thoughts were turning to Quest 3.0, which would be a huge update – I was getting lots of suggestions from users, and there were various aspects of Quest I wanted to tidy up – things which didn’t make sense to me at all any more, such as: why was “an object in a room” a separate concept to “an item you can carry”? It was time for the first of many overhauls of Quest. In the mean-time I carried on releasing bug-fixed versions of v2.1 up until Quest 2.19, which was released in January 2001. Next time I’ll carry on with a look back at version 3.0 and beyond. If you want to peruse some archive material, the forums from 1998-2000 are still online. This entry was posted in Quest and tagged history on November 26, 2013 by textadventurescouk. So Quest is itself now almost as old as I was when I started writing it. But what got me started on it in the first place? Well, no. That’s not how it happened. I never played any of those. In fact, I was never really into text adventures at all. But then, they were before my time. I was just a bit too young. I first dabbled with a computer in, oh, about 1990 or so. We had an Acorn Electron in our house. We did have a couple of text adventures for that – we had a copy of Acornsoft‘s Sphinx Adventure (never really played it, couldn’t get anywhere, found it boring) and my dad had typed in the listing of a game called Necromancer from Electron User magazine. Which never quite worked properly, as something had been mis-typed somewhere along the line. So I was just never that interested in text adventures. I was more into playing whatever shareware games had found their way onto my PC – Commander Keen, Wolfenstein, Doom and so on. But what I was much more interested in was creating my own. I probably spent more time in front of QBasic than any game. And that is where it all begins, really. In 1994, at the age of 12 I started secondary school. The IT lab there was open at lunchtime for anybody to use. So instead of running around getting exercise, or loitering somewhere else, me and my friends played around with the computers. They were probably 486s, running MS-DOS 6 and Windows 3.1. They were connected to some kind of network but there was no internet access – we’d barely heard of this internet thing anyway back then. There wasn’t a whole lot to do other than write silly little programs using QBasic (or Visual Basic 3.0, which was also installed) so that’s what we did. After my schoolfriend Martyn moved house and went to a different school, we kept in touch by writing letters to each other – this being a time before either of us had an email address. We would enclose 3.5″ floppy disks to share our latest programming efforts. It was in fact in Martyn’s first letter, around January 1995, that he sent me a game he’d written called “Sid Snibble and the Curse of the Curry Stain“. It was a text adventure, but even this had a graphical element to it – you didn’t walk around the game by typing NORTH, SOUTH etc., you moved an ASCII face around with the arrow keys. When you entered a location, you could look at things, speak to characters, pick up items and so on – all in an attempt to solve the mystery of what happened the night before, and why you woke up in the middle of the road in a strange town with a large curry stain down your shirt. This looked fun. I could write something like this. It would be hilarious! And so I set to work, doing what I’d always done – copying Martyn’s ideas, but doing them a lot worse. So, in April 1995 I wrote my first text adventure game. How I wish that weren’t true. How I wish I could sit here and tell you the story of how I poured my soul into a creative work of genius, a work of art, a literary masterpiece. With a title like that, maybe I could claim that it was an earnest work exploring gender issues. But it wasn’t. I was 12. The game was an excuse for a load of the kind of sophisticated humour that 12 year olds are known for. Featuring locations such as Dracula’s castle, a teacher’s house, a corner shop, a dairy, a Skoda dealer and Potato World. So, a throwaway game that should be played by nobody. But for me, a 12 year old boy who didn’t do any kind of creative writing, it was a fun thing to do that got some kind of creative juices flowing. Anyway, back to my, er, game. I sent it to Martyn on a floppy disk together with a second one called “Make Mrs Booth Friendly!“, a game about my French teacher. Also on that disk, I included a terrible chatbot, “Dr Mad!” who would diagnose your illness, and a fortune teller called “Sadistic Smeg”. Over the following months I wrote some more text adventure games, always full of in-jokes about school, only ever written for my friends, and never to be seen by anybody else ever, certainly not now. “It’s Mad!“, “Fantasy Land!“, “Park Parade Adventure!” and “The Town of Terror“. It seems the running theme was titles with exclamation marks. Fast forward a few years to 1998, when I’d started dabbling with Visual Basic 5.0 – which meant I was no longer stuck writing programs for DOS, I could create programs for Windows instead, featuring buttons and menus and message boxes and pictures and everything. I was rather stuck for ideas though. I’d spent some time working on a virtual pet, which were all the rage back then, but wanted to try something a bit meatier. I’d just finished my GCSE exams and was looking for something to keep me occupied over the summer break before I started sixth form. 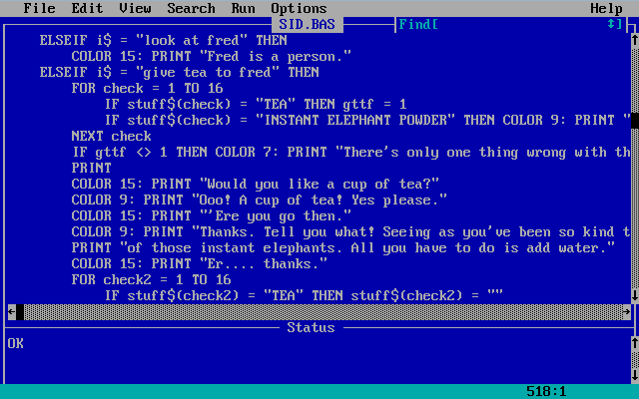 I thought back to the text adventures I’d written, and wondered – what would a text adventure game for Windows look like? I decided to write myself a little engine before writing a game, so I wouldn’t have to hard-code everything like I’d done in QBasic. I started coding something that would take in a simple text file which would define all aspects of the game, and handle things such as allowing players to save their progress. It turned out that I was actually far more interested in creating the engine than I was in writing a game anyway, and I was interested to see what other people might come up with if they used my system. At the time, I was fairly ignorant of any pre-existing systems which would do a similar thing to mine, until somebody suggested I take a look at the rec.arts.int-fiction newsgroup. I started checking out the competition, and reading about Inform and TADS. It was clear to me that they were difficult for newcomers to use (this was before Inform had a natural language syntax – the syntax of Inform 6 still looks bizarre to me), so it looked like I should be able to get people interested in what I was doing. 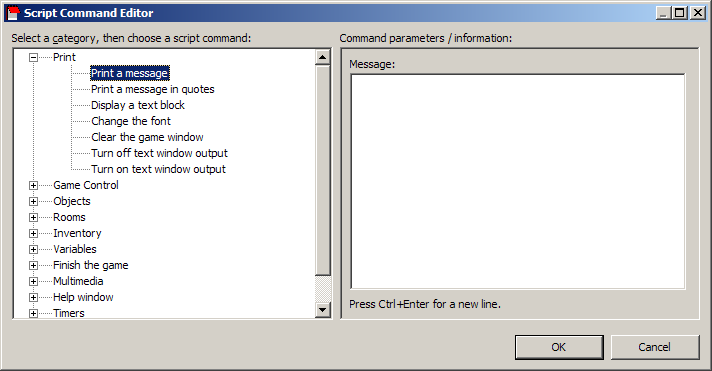 Quest 1.0 loaded text files which were in a simple format I’d devised, called ASL – Adventure Scripting Language. The syntax was simple, designed to be coded by hand using Notepad or similar – there was no visual editor yet (“QDK” appeared the following year). This file format lasted a long time. It was used right up until Quest 4.x, the last version of which was released in 2011 – albeit heavily extended and changed in various ways over the years. The user interface is still very similar to what Quest offers now – in fact, after it was rearranged in Quest 2.1 it has effectively remained an identical layout. There is the game text of course, a command box, a space to show what items you’re carrying, and a list of things you can see in the current location (which would show “Look at” and “Take” buttons if something was selected). There are also the compass buttons for easier navigation. Quest 1.0 supported rooms, characters, objects, things you could pick up (“items”), quantities of things (“collectables”), string variables and some basic script commands. It could play WAV files, show images and display pop-up menus. It supported text formatting, and let you set up your own custom commands using a syntax like “eat #object#” – the same format that is still used in Quest 5 today. There was a small sample game distributed with Quest 1.0, “A day in the life of a salesman“. It is of a very similar standard to my QBasic efforts – which is to say stupid, crude and borderline offensive in places. So no, you can’t have a copy, but yes, it does still run in Quest 5.4! What happened next? We’ll pick up the story in the next blog post, where I’ll talk about how Quest grew, changed and even shrunk over the years to become what it is today. This entry was posted in Quest and tagged history on November 7, 2013 by textadventurescouk.